What Machu Picchu is to Peru, the Lost City is to Colombia. 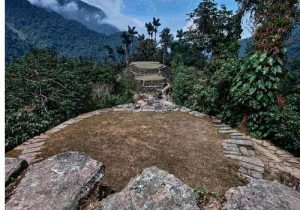 The Lost City or Ciudad Perdida, is an ancient city and sacred site of the Tayrona Civilization, that once covered the Caribbean coastal plain of Colombia and extended to the highest coastal mountain range on earth, the Sierra Nevadas of Santa Marta. Any traveler can see Machu Picchu- by bus, plane, or taxi- but only an adventurous trekker can dare to explore the Lost City. 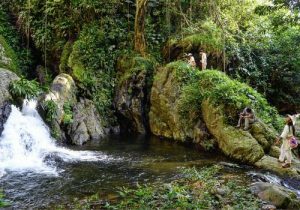 Alongside a knowledgeable, bilingual indigenous guide, commit to a minimum 4-day 70-km trek on ancient trails carved in mountain and jungles that cross over rivers and waterfalls. Keep your bathing suit at the top of the pack as there is another swimming hole waiting for you at Mumake. It’s about 5-10 min walk away, but a dip in the refreshing, chilly waters is wonderful! It’s about an hour walk from the campsite to the start of the 1200 step climb up to the Lost City. It sounds like this part would take forever, but you can easily reach the top of the stairs within 20 mins! Upon completing your Lost City tour, begin your return along the river bend and back to Paraiso Teyuna Camp for lunch. Extend your trip by one day and one night to visit an Arhuaco village after your trek. Have the rare chance to connect with indigenous leaders by visiting their village situated on a beach by the sea and a beautiful river. Feel free to bring your bathing suit to swim or go fishing and indulge in local fish stews. Connect with the local weavers and watch as they make traditional weaving handicrafts, such as the Arhuaco “mochila”, or purse. Stay overnight at Taironaka Tourism Eco lodge and Archeology site located on the Don Diego River close to an Arhuaco village. In the evening, enjoy delicious food prepared by chefs at the lodge’s restaurant and stay overnight at the ecolodge. The following morning, you can float down the river in kayak or tubes to reach your own private beach on the sea, and return for transport to Santa Marta. The 5-Day Trek option, which breaks up the return journey by splitting up the 4th day of hiking into 2 shorter days. Those on the 5 Day trek will have lunch, enjoy the rock pools, and rest at Adan Camp. The following morning, you’ll take a leisurely 3-hour walk from Adan Camp to El Mamey where you’ll have lunch and catch a 4WD ride back to Santa Marta. There is also a 6-Day Trek option, which breaks up the 2nd (the longest and most exhausting day) into 2 days. Accommodation on the trek include clean campsites with bunk beds instead of just hammocks to sleep in for the night. 3 out of 5 = Several moderate physical activities raise your heartbeat on this trip. A good level of physical fitness is required. This trek is not technical & it does not require any equipment or any particular skills, but walking sticks, and a determined attitude, are highly recommended. Dry Season (which runs from December through to early March) and rainy season (March to November). 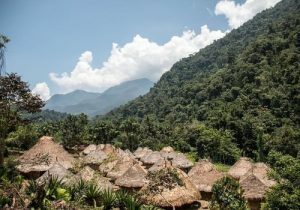 Treks to the Lost City are offered year around, but if you have a chance to choose when to trek, go in the dry season. Hiking in the rain on this hike is not ideal, to say the least.